If you ever have the pleasure of traveling the remnants of the Lincoln Highway in Nevada, be sure to make some time for Ely. Like many other night ramblers, I have been seduced by the glow of the lights of this lively town, where there are plenty of places to take a hot shower, wrestle with a steak, and test one’s luck at games of chance. My preferred spot for all of these pursuits is the historic Hotel Nevada and Gambling Hall, in the heart of downtown. When completed in 1929, the six-story hotel was not only the tallest building in the state but also the first one to be fireproof. For many years, the Nevada was a popular stopover for the Hollywood crowd en route to the slopes of Sun Valley. The impressive guest list has included Ingrid Bergman, Gary Cooper, Jimmy Stewart, Lyndon Johnson, Mickey Rooney, Ray Milland, and Evel Knievel. It is rumored that Frank Sinatra — without his “Rat Pack” — quietly checked in once or twice for some rest and recuperation from the hubbub of Las Vegas. Just like the rest of Ely — once home to several mining companies — the hotel has had to endure the boom-and-bust cycles of the copper industry. 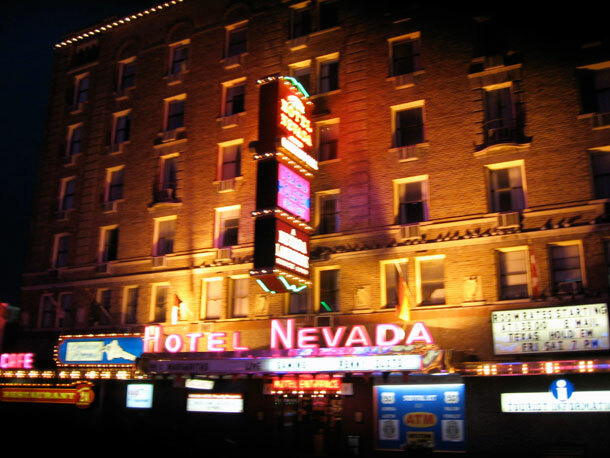 In the 1990s, the Nevada was completely restored, and the comfortable guest rooms are named for some of the luminaries who once stayed there. Guests find a pair of suckers on their pillows at night, a reference — in good fun — to the name for the vast majority of gamblers.